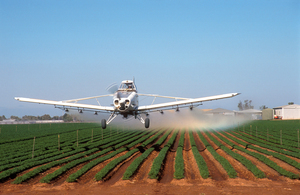 Aerial spraying, using fungicides/herbicides, of a carrot crop by Godfrey Gardner of Agricair at Virginia, SA. 2003. Photographer : Greg Rinder on January 01 2003.